It's a place you feel like you're floating. You sleep between pristine sheets in a magnificent four-poster bed, in an open-plan room leading to a stunning bathroom with sunken marble bath tub, which looks out onto your own private plunge pool. Outside of that personal little heaven, beautiful, smiling staff stroll around, bidding you good day in their crisp, clean uniforms with pearly white smiles. You get spa treatments twice a day and the most intricate breakfast spread I've ever seen (which you can have in your room, at the pool, at the beach or wherever else one would want to eat breakfast). You can do morning yoga, cookery classes, visit an orphanage, visit one of the staff member's families, learn Vietnamese or just frolic in the pool. On arrival at Fusion Maia, in Da Nang, I'm greeted with an iced tea and a promise the spa resort will change me. And it does. Apart from the occasional mini bar gin raid (the quinine in the tonic, I'm told, keeps the mozzies away), I feel peaceful, healthy and can barely leave my room, let alone the resort. However, just an hour from the ancient town of Hoi An (where seams of tailors line the streets), frolicking - I mean rejuvenation - time must be kept to a minimum. Strolling around and taking in the history of the trading port, which is a UNESCO world heritage site, the pagodas and houses are beautifully preserved and worth a visit. Don't forget to bring clothes examples and patterns to get tailor-made outfits. Before finding peace in Da Nang, but after partying in the bright city lights of Saigon, I stopped for a trip in the beach city of Nha Trang. It's nice to feel the laid-back seaside attitude after the chaos of Saigon, and Nha Trang is trying very hard to be "the" holiday destination for Westerners. The seascape has fantastic: mountainous, rainforest islands, but then a huge Hollywood-esque sign is hacked out of the side of one, and resorts are sprouting like mushrooms. 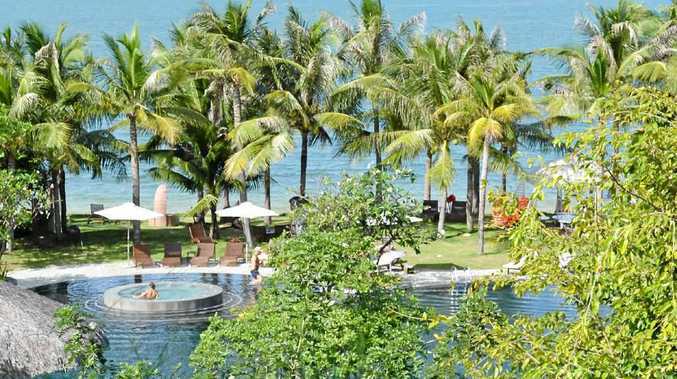 The city's Sheraton Nha Trang Resort and Spa is a good place to base yourself. It's modern, with every amenity you could ask for, and not carved out of the rainforest. We head by boat to Ho Tam Eco Green Resort and I'm immediately in shock. As we walk along the private beach, thumping eastern European dance music pumps from the poolside where both old and fat or young and tanned Russians conduct endless photo shoots. For a small price, the playboys and playgirls can have their golden (sometimes red) bodies and their slice of paradise immortalised on a mug or poster. Back in Nha Trang and back to my favourite thing, the nightlife; but if you want to learn one thing from my trip, it's don't drink the Vietnamese jam jars. The waitress at Nha Trang's Sailing Club assures me there's just one shot in my massive vodka, soda and lime. It's a great place to hang out and have sunset drinks before travellers from all over, and locals, dance the night away through the jam-jar haze. Another scooter ride home and then it's off to paradise to recover.